Cloud 109: More Commandos From Waaaaaaaayyy Back When. 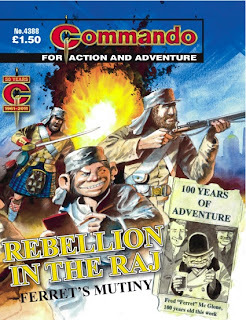 Just had a heads up from editor Calum Laird that the following four Commandos are roaming the shelves of your nearest news vendor or failing that there's always Commando's very own website where you can buy, subscribe or even download to your iPad these little gems. 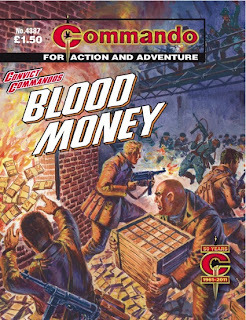 As it's Commando's fiftieth anniversary the reprints of those early issues continue (let's hope they continue AFTER the bunting has come down). 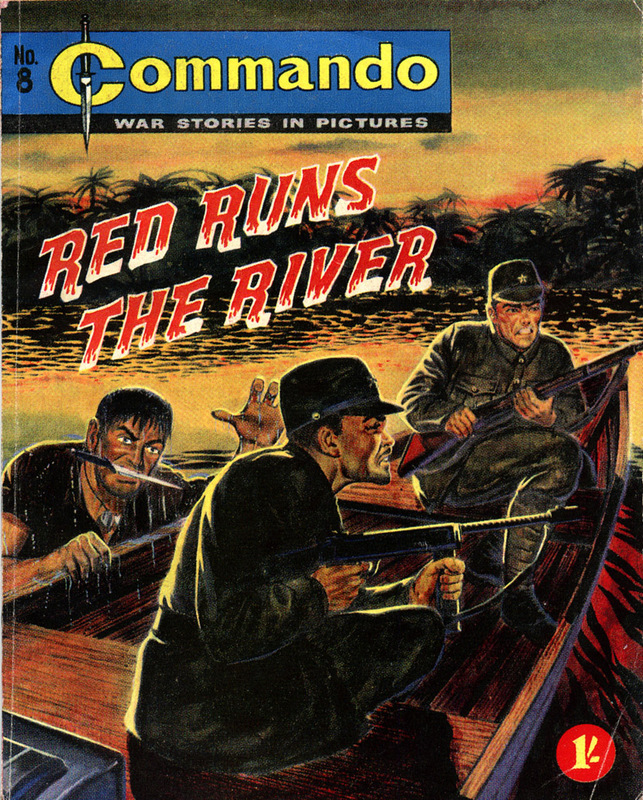 We're back to issue 8 with Red Runs the River and yet another knockout Ken Barr cover. 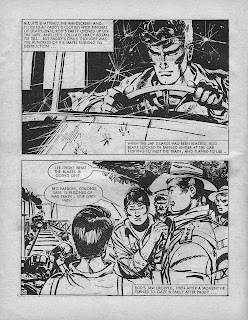 I'm running the original alongside so you can see what a superb job the Commando team have made in not tampering too much with the feel and power of the original comic - even down to the lettering. There's a lot to be said for hand drawn lettering and this cover is yet another example of why. Also noteworthy is the inclusion of a story by Spanish artist Rafael Auraleon, who really makes the most of the moody text to spirit up some dark and dense artwork. 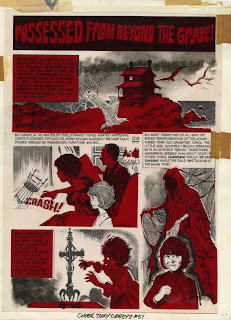 Yet another of the Selecciones Illustrados artists on Josep Toutain's impressive roster, Auraleon went on to become one of James Warren's most prolific artists, where his work spanned all of Warren's horror magazines but Vampirella was where his work most frequently appeared. 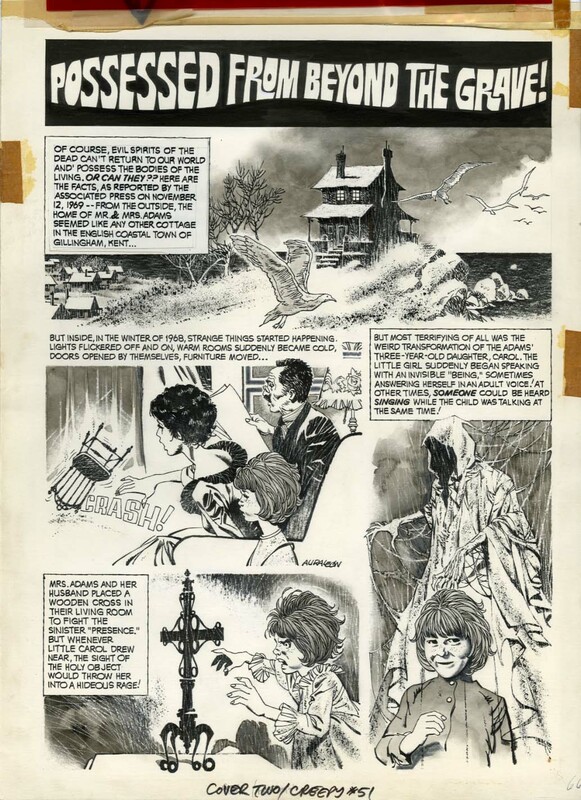 Auraleon left the comics field shortly after James Warren's publishing empire folded and some years later in a fit of depression Rafael Auraleon committed suicide. His amazing work is a lasting legacy and is still poured over by comic aficionados to this day. The images with the overlay are from an artwork originally created for Creepy No. 51, currently on sale at the Lewis Wayne Gallery. Creepy © New Comic Company LLC 2011. If there was one thing the Convict Commandos — Jelly Jakes, Smiler Dawson, Titch Mooney — liked, it was easy money. Unfortunately the money their leader Guy Tenby had them chasing wasn’t easy, it was very difficult indeed. For it was in Nazi-Occupied Norway and the Nazis didn’t want them to get anywhere near it. He’s back ⎯ as you’ve never seen him before! Veteran war reporter Fred “Ferret” McGlone celebrates his landmark 100th birthday in style — and reminisces about his earliest days as a roving newshound on the shady, cobbled back streets of Victorian London. Naturally, that’s only the half of it. What about Ferret’s thrilling adventures on the high seas? Or his dangerous despatches from the front line chaos at the heart of the British Empire in India? Get the inside scoop on this cracking story — a Commando exclusive, of course. It’s one you won’t want to miss! 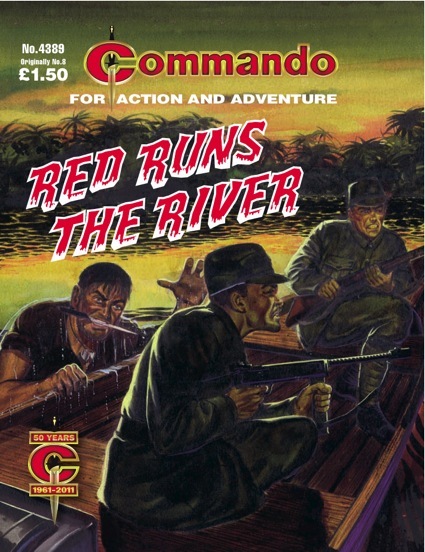 The early batch of Commando stories contained a fair few jungle tales — complete with fanatical enemies. But this one isn’t quite like the others as the fanatic is on the British side. He’s a fighting mad Irishman determined to settle a score with the Japanese, and any Japanese will do. The trouble is that his own side need to keep him out of the fighting as he’s too valuable to lose. Eric Hebden weaves a classic Commando here, ably backed up by Auraleon and Ken Barr. Many and fearsome are the perils that can beset a man on a swift-flowing river after dark. Japanese river patrols knew all these dangers, but armed to the teeth they feared none of them. Then, one dark night, there glided into that gleaming river a new menace that was to strike terror into every Jap soldier…a swimming Irishman with hatred in his heart and a Commando knife between his teeth. I’d love to tell you how I remembered this story’s memorable characters, well-thought-out, men-on-a-mission plot and action-packed finale from the day I first read it. I’d love to…but, to be honest, the thing I remembered most vividly from reading “Paratrooper” in 1980 was the awesome sight of British soldiers whizzing around occupied France on cool little motorbikes. As a child I recall wanting to have a go on one of those dinky Wellbikes. Thirty years on, re-discovering this great tale has been a wonderful trip down memory lane (but sadly, not on a Wellbike). And, yes, I still want to have a go on one. They floated out of the sky into the fields of enemy-occupied France. For this crack team of British paratroopers it was the moment of truth. Commando © DC Thomson 2011. I too hope they continue with the early reprints Peter. 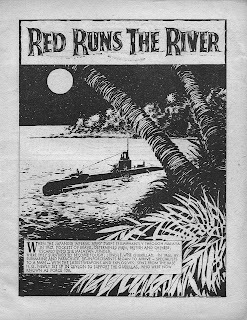 The latest two seem particularly interesting: 'Red Runs the River' must feature some of Auraleon's earliest work and - assuming 'Blasco' is Jesus Blasco - we can look forward to two Warren artists in the same month (though in this country Jesus is more likely to be familiar from his work on Valiant's long-running Steel Claw strip). To be honest I didn't know that the latter had ever even appeared in a DC Thomson comic. 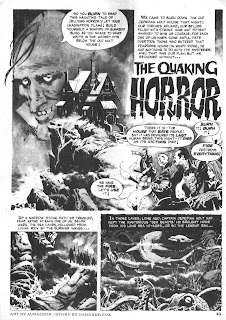 Nor was I aware of Auraleon's sad end (which puts me in mind of a memorable 1980s 'Heavy Metal' strip in which a Spanish artist committed suicide after years of drawing soulless English-language Romance strips for the British market!). 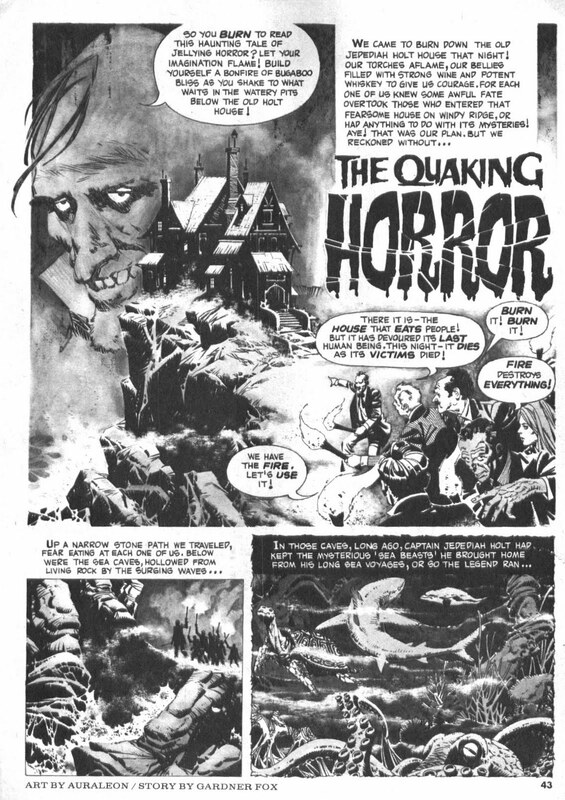 The Massacre After Moonrise heading appeared on the back of issue 8, Phil. 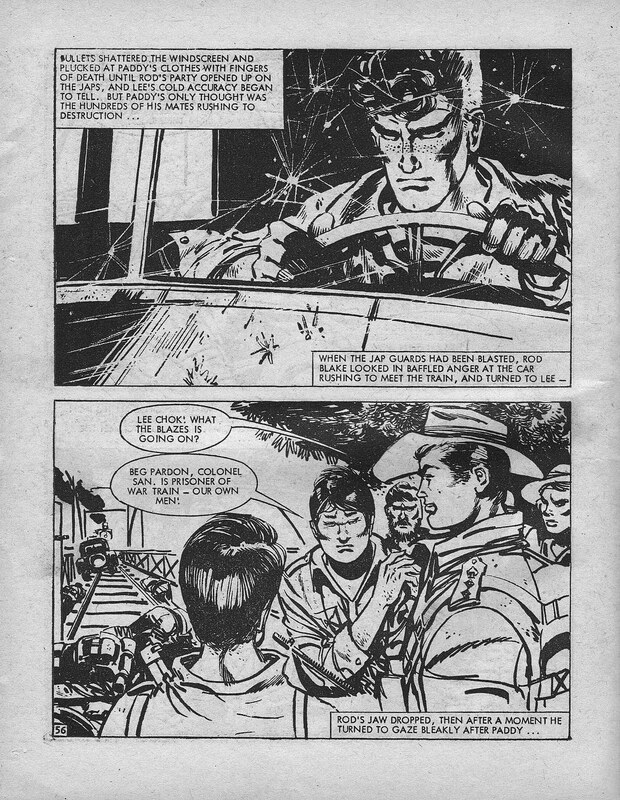 Eric Hebden's working title for the story was Force 136, while issue 61 of Commando was titled Massacre by Moonlight. And (going for the Comic Anorak Silver Star! ), issue 28 was titled Massacre in the Sun. Oh yes and (now going for the Comic Anorak Get A Life For Christ's Sake Gold Star with Laurel Wreath) issue 25 Take No Prisoners had the working title of Massacre by Moonlight. Again written by Eric Hebden. 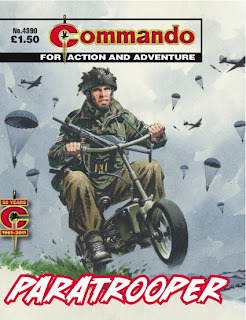 Just had a look at 'Paratrooper' and it clearly wasn't drawn by Jesus Blasco, or the sister and brothers who worked as part of his studio. At a guess I'd say it must be Jaime Blasco instead.